ABEOKUTA—THE Federal Government, yesterday, pledged its support for the victims of flood in some parts of Ogun State describing the incident as unfortunate. The Vice-President, Prof. Yemi Osinbajo said this in Abeokuta during an inspection of some areas in the state that were affected by the flood. Osinbajo, who arrived Abeokuta in a helicopter at 4:32 pm with Finance Minister Kemi Adeosun, was received by Governor Ibikunle Amosun of Ogun State at the Arcade ground at governor’s office, Oke-Mosan. The Vice-President was immediately taken round to all the affected areas which include; Isale-Igbein, Kuto, Ijaiye, Itoku among others. 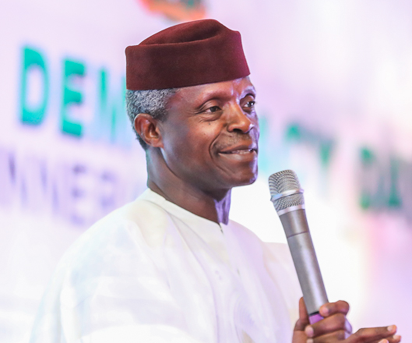 Addressing newsmen, Osinbajo described the incident as unfortunate, adding that the Federal felt concerned about the incident. He said: “Let me say that what has happened here is very unfortunate indeed, a lot of drainages have been done but then a level of the rain has been so heavy that it has overtaken the infrastructure in place. “So, but what we are looking at is how this can be enhanced and we are also discussing with His Excellency on how the Federal Government can be of assistance. “We have to really sit down and look at those challenges properly, we are providing immediate relief materials to support the state government. “We are fortunate that it didn’t take place at night because if it did, and there is a sudden surge of water, it would naturally cause a lot of disasters. “One of the things that we have to do as a people is that we have to change our attitude of blocking drainages, despite channelisation, where you have much rain falling with short hours, we are likely to have this kind of situation.